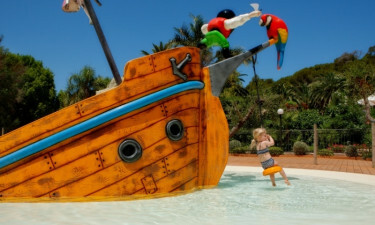 Situated on the island of Elba, off the Tuscan coast of Italy, Rosselba le Palme is a luxury camping experience for the whole family. With a range of bungalow tents and mobile homes to suit every size of family, a pool complex, sports and activities, and even a diving centre, you're sure to have a great time. Book your camping holiday with Lux-Camp and prepare for camping luxury! 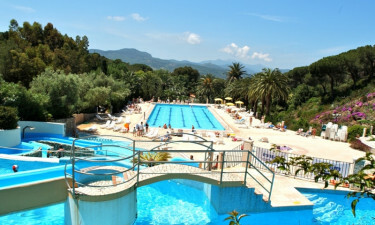 Why camp at Rosselba le Palme? Our luxury camping site is within easy reach of Elba's many quiet and unspoiled beaches, so you're sure to find one to your liking. Enjoy cycling the network of bike paths, or take to the seas with sailing, diving, and whale watching trips. Historic sites include castles and hill forts. Don't miss the climb to the top of Monte Capanne, the island's highest mountain. Rosselba le Palme has its own restaurant, bar, and mini market for all your needs. If you fancy a change, head out to Portoferraio, Elba's largest city, or one of the other seaside towns. You'll find typical Italian and Tuscan pasta dishes and pizza, along with the grilled meat and fish of the Mediterranean, and, of course, ice cream. Take some of the local produce, like wine and olive oil, home with you, or choose local pottery and perfume as souvenirs.